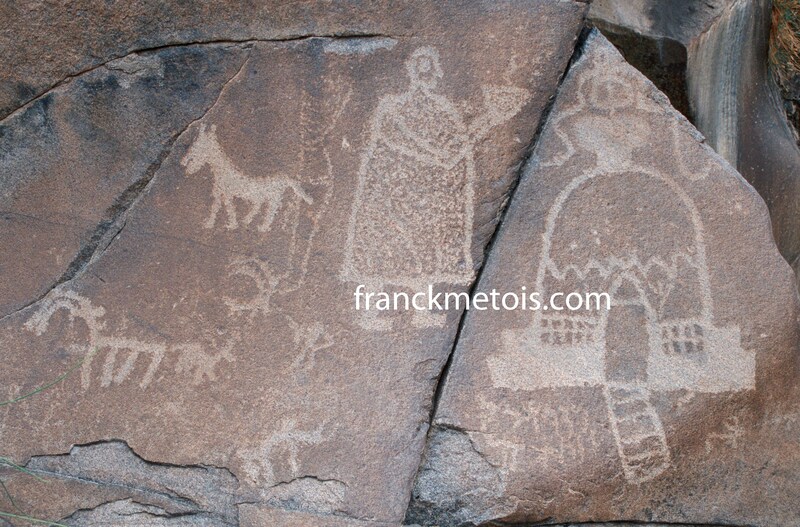 Buddhist rock paintings. In northern Pakistan, buddhist rock art is dating from the 1° century AD until the 10° century AD. Pakistan offers some of the best trekking in the world. The Karakoram, Himalaya and Hindu Kush ranges which dominate northern Pakistan are truly spectacular. They encompass soaring mountains of rock, ice and snow, huge sweeping glaciers, plateaux and high pastures carpeted with grass and flowers in summer, valleys of contrasting bare rock and fertile irrigated settlements, and rich pine forests lower down. Yet the potential of this region remains for the most part undiscovered. With the exception of one or two areas ( the trek to the base camp of K2 in particular), trekking in Pakistan is completely free of crowds and pollution. The days when European explorers set out to fill on the “blanks on the map” may be past, but this region remains one of the least comprehensively mapped in the world and is still full of adventure and excitement. Aside from the natural beauty of the mountains and the peaceful, unspoilt solitude they offer, perhaps the most rewarding aspect of trekking in Pakistan is the contact it brings with the people who inhabit this beautiful and yet harsh environment. With one or two notable exceptions, the people of northern Pakistan are friendly, hospitable and open in a way which seems to be characteristic of mountain people throughout the world. In Pakistan, this is complemented by a fascinating variety of cultures; moving from one valley to the next it is often possible to witness a complete change in the traditions, lifestyle, language and ethnic origins of the people. Trekking in Pakistan is more demanding than in countries such as Nepal and even India, where facilities are much more developed. Any trek involves having all the supplies and equipment, as well as the physical stamina, to be completely self-sufficient if need be. On many treks it is perfectly possible to go for several days at a time without encounering any permanent settlements, and even in areas that are settled, agriculture at subsistance level, making it impossible ( and unfair) to rely on them for food. During the 18° century, the French ( monarchy) tried to colonize India. Dupleix, then governor general of the French establishments in India and the greatest rival of Robert Clive ( then British governor of Bengal), achieved to rule half of South India thanks to his diplomatic and commercial acute sense : he intervened directly with the South Indian princes by giving his army of sepoys in exchange of territories. In 1763, the Paris treaty ended the Seven Years’ war between the European nations, particularly between France and England. The confrontation between the two nations spred to North America and India where both countries had colonies. Being defeated, France had to abandon its colonies in North America while in India, France retained only five territories, the establishments of Pondichéry, Karikal, Yanaon, Mahé and Chandernagor. All of them were placed under British surveillance. Dozens of French officers were demobilized or deserted their garrisons to sell their services to Indian princes. ( After all, most of them came in India to become rich, not to serve their king.) Those who stayed to serve Indian princes had under their command Indian soldiers who were trained the European way. Once engaged, these adventurers were in charge of armies comprising sometimes thousands of men, cosmopolitan battalions with officers coming from France, Italy, Netherlands, Germany,… Because of their discipline and their ability, such artillery units were dreaded by the other Indian princes. Many times, their strike force made the difference. In return for their services, these adventurers received huge domaines where they almost ruled like monarchs, where the French flag was sometimes flying. While the British considered them as agents spying on behalf of France, most of these adventurers pursued their own personal goals ( i.e. making money). Claude Martin ( 1735-1800) was one of them. When he was still very young, he embarked to India where he served France for five years. Then, he was taken prisoner by the British but betrayed his country to serve them. He enlisted another Frenchman, René Madec, who had also been captured by the British at Gingee ( near Pondichéry) in 1761. Throughout India, Madec became famous for his military skills. At some point, he was in charge of an army comprising 100 000 men trained by 150 European officers. Benoît de Boigne ( 1751-1830) was another romantical character. First, he enrolled to serve the British before serving the Maratha kings. He was then at the head of an army of 30 000 men and became the ruler of a significant part of northern India. Known as efficient warriors, sometimes overestimated, the French adventurers were also well-advised businessmen. Claude Martin made a fortune thanks to the indigo trade. Despite of their long-term sojourn abroad, they had not forgotten their native country. When he came back in Europe in 1795, Boigne was filthy rich. He used his fortune to embellish his native town, Chambéry. Ennobled by Louis XVI, Madec came back to his native Brittany to live a quiet life with his wife. Many times the villagers saw him riding his horse in the moor, accompanied by his loyal indian servant. Because India is blessed by a warm climate, a rich soil, abundant productivity and easy communication, the ( traditional) Indian mind feel in harmony with the nature, with the universe. Contrary to the western mind that assigns great importance to the struggle between man and his physical environment and regards the conquest of nature as the key to cultural progress, the ( traditional) Indian mind doesn’t regard the world as a place full of forces that have to be fought and dominated but as a place where man has to adapt. One would expect that in a mind where contemplation dominates, passion and desires would not be very strong. But that is not the case with the Indian temperament which is emotional and imaginative. Emotionalism and sensuousness are essential characteristics of the Indian mind, but these tendencies being opposed to the speculative trend, there is always a strong effort to suppress them. Another characteristic of the Indian mind that originate from the influence of the regularity of the weather is that changes are gradual, not abrupt. So, there is no place for revolution. The Indian mind is capable of big changes but it takes time. New ideas and movements need time before being accepted. 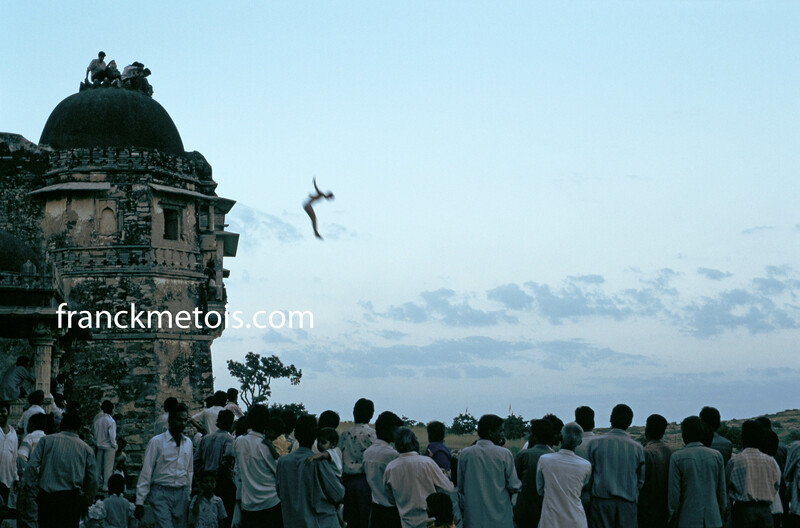 Diving in the mediaeval fort of Chittor. India. In theory, vehicles drive on the left ! But many drivers tend to forget the good manners… Moreover, pedestrians, cattle and a wide range of other animals roam at will. It can be particularly dangerous when driving after dark because few vehicles are ever lit. The general rule of night-driving seems to be kill your lights as you approach an on-coming vehicle, and then hit them with the full beam just before you pass ! Similarly, use of the indicator lights does not necessarily mean “I am turning right/left”; it can also be read as “Please overtake me to the left/right !”. Twenty years ago, the parsis living in Bombay used to offer to the vultures their own dead. Since centuries, that’s the way parsis got rid of their dead. By respecting this tradition, none of the sacred elements ( air, earth, water, fire, ether) was polluted. Something essential for the parsis, a community that follow the teachings of Zoroaster ( a Persian prophet who lived in the VII°-VI° centuries). Now, there are no more vultures in the “towers of silence”( the places where the dead Parsis are left). Indeed, since the 90’s, millions of vultures in India have been decimated by an anti-inflamatory the indians used to administer to the cattle, diclofenac. So, parsis have replaced the scavengers of the skies by solar panels to get rid of their dead. But vultures could come back : two breeding farms should open near the towers of Malabar Hill ( in Bombay)…in 2014. If everything is OK, the vultures will replace the solar panels . ( Solar energy is non operational during the monsoon.) It will cost 3.8 millions euros ( IRs 275.000.000, US$ 5.000.000) for the next 15 years : nothing for the parsis, the richest community in India. “Most of the bird farms spend fortunes to buy meat, but for us, it’s free because the vultures eat carcasses, our own bodies,” says D.R. Mehta, the person in charge of the project. In 1975, one of the “towers of silence” had to be closed following the construction of three high-rise buildings near the necropolis. Some dwellers didn’t like to have such a fantastic view over…the carcasses and the feeding of the scavengers ! Jaïn monk in India. In jaïnism, perfection means knowing the scriptures, being wise,… and being able to strip naked in public. Why do we feel we have to be good at something to try it, that we have to succeed at something in order to enjoy it, that we have to do something right before we feel accomplished ? Striving for perfection can create frustration and disappointment. But doing something imperfectly leads to new insights and a new way of looking at things. Spontaneity : perfection is a way to be in control. But control limits spontaneity. Process : when we focus on perfection, we are in the game for the product, for mastery, not the process. We compare ourselves against people who are further along in the process and can’t enjoy our own progress. Completion : the higher the goals of perfection, the lower the hopes of completion. Mystery : there is mystery all around us and enjoying the mystery evolves us. Perfection doesn’t honour the mystery. Authenticity : striving for perfection doesn’t allow us to be authentic. When we let go of perfection, allow ourselves to do things imperfectly, we come to see how good we are, just the way we are. So our lives can be improved when we let go of perfection.